With pretty much everyone focused on actually getting their hands on the iPad as soon as possible with pre orders already kicked off, many people have missed some of the exciting new details Apple has been posting on their site. One interesting aspect of the new info under the iPad tab on Apple.com is pages for the iWork applications shown off at the product launch that seem to be the only real stock apps that set the device aside from the iPhone and iPod Touch. For those of you that are interested in getting a closer look at how Keynote, Pages, and Numbers work on the iPad, look no further. The most powerful presentation app ever designed for a mobile device. 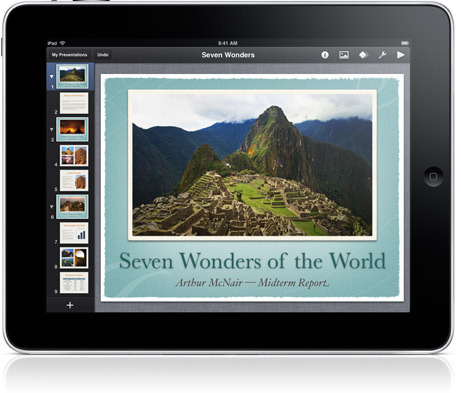 Keynote is the powerful presentation app you love from iWork, completely reworked for iPad and Multi-Touch. So you can do everything on iPad with a tap or drag of your finger — from creating your first slide to presenting your work. The most beautiful word processor ever designed for a mobile device. A touch of brilliance for your writing. 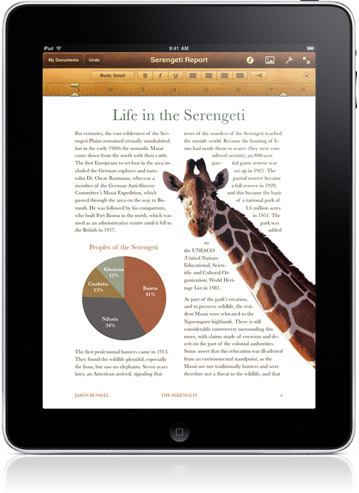 Pages for iPad combines robust writing and advanced layout tools with the simplicity of Multi-Touch. So you can create all kinds of documents — including newsletters, reports, brochures, and flyers — using just your fingers. Choose from 16 Apple-designed templates, and you’re off to a beautiful start. Text is crisp, clear, and very readable on the large, bright iPad screen. And the handy page navigator lets you scroll through your document in thumbnails, so you can quickly jump to any page you want. The most innovative spreadsheet app ever designed for a mobile device. It’s easy to be good with Numbers. Who knew making spreadsheets could feel so natural? Numbers is the most powerful spreadsheet app designed to work with iPad and Multi-Touch technology. 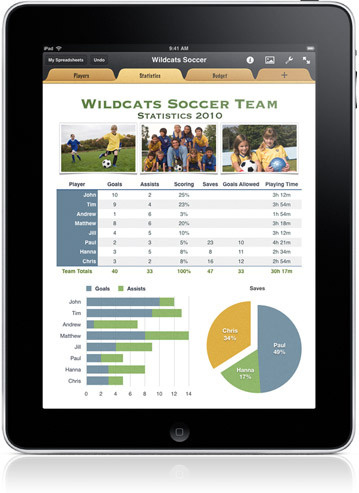 With a few taps, you can create tables and charts, add photos and graphics, and enter and edit data. Numbers isn’t just a spreadsheet application — it’s a flexible canvas. Which means you can add multiple tables and charts anywhere on a sheet and move them wherever you like. And every spreadsheet starts out stunning, thanks to Apple-designed templates. Choose from 16 templates for home, work, and school, then make it your own. Previous Entry: Opera Mini Beta for iPhone Weeks Away?